Please feel free to attend even if you are not a member. We always have a presentation by someone with a special knowlege of some aspect of orchid growing. There is the Show and tell table where members bring their best orchids to show off. The Opportunity Table brings the general meeting to a close. All proceeds go to the general fund of the Society. During meetings, members will bring in orchids for sale, and the Society offers orchid related supplies. 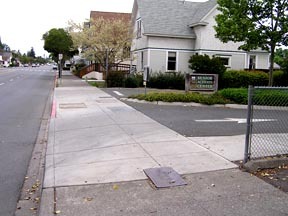 From Soscol Ave: Take the Third street bridge and follow Third st down to Jefferson, then turn right. From Hwy 29: Take the First St exit and follow Second St east to Jefferson, then turn left. There will be a slight jog left where the 2 sections of Jefferson didn't line up. 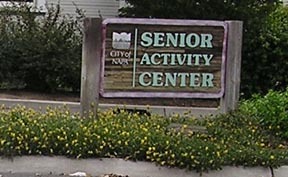 The Senior Center is on the right, and the parking entrance is just past the Senior Center itself and has its own sign.